Why choose Nuffield Health Glasgow Hospital for your spinal care? Our consultants and physiotherapists are among the most experienced and respected in Glasgow. Our Spinal Centre in Glasgow is home to Mr Fraser Dean and Mr Nick Brownson, two highly qualified and established orthopaedic spinal surgeons. Our surgeons have been commended on their ability to talk patients through their condition and to explain the reasons behind the spinal pain and discomfort that you are experiencing. We can provide you with rapid access to treatment and have multiple spinal clinics running throughout the week, so there are numerous options for you to tackle your back pain, to suit your availability. Our multidisciplinary team of spinal specialists can provide patients an accurate diagnosis and personalised treatment plan for all spine conditions, often in the first visit. Our spinal surgeons work closely with other clinical colleagues, offering patients some of the most comprehensive spinal treatments available. 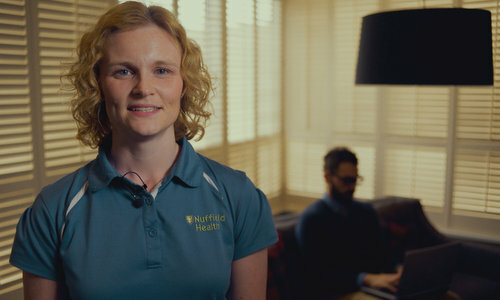 Patient satisfaction after spinal consultations and treatment at Nuffield Health Glasgow Hospital is regularly monitored, and is extremely high. Only about 15% of patients seen by the consultants presenting with spine pain will need surgery. We know it is important that you choose to see the right spinal specialists with experience in spinal conditions that can help prevent, diagnose, treat and rehabilitate your condition. Our Spinal surgeons and pain management consultants have particular expertise in dealing with procedures for, degenerative conditions and spinal deformities and general spinal pain. This covers a significant number of common back and neck pain conditions. Please call our dedicated hospital enquiry team on 01413 349 441 or fill out a contact form below to arrange a consultation with our experts. The Nuffield Glasgow Spinal Centre offers a full range of treatment choices in addition to surgery. We can provide non-surgical treatment options including pain management and spinal injection and physiotherapy, with an emphasis on education in spinal pain and injury prevention and therapy through rehabilitation exercises. Fill in the contact form below, or give us a call.